Dark-Faire is a Semi-Vanilla friendly survival Minecraft server with emphasis on the community and building. The majority of our players come from Slovakia and Czech Republic so we mostly work in Slovak. And as the whole website is also in Slovak, we dedicated this page to our players who don’t speak the language but want to play on Dark-Faire. You can find our rules and game commands below. Most of our players speak English to some degree as well, but if you find yourself in a situation where you need more help, don’t hesitate to contact our A-team (administrators gnar86 and takatalvi) either in-game or using the form at the bottom of this page. The server uses only the basic plugins, most of which are only necessary for administration. You as the player have access to some of their functionalities, which are described in the Commands section below, or accessible in-game by typing /commands (pages 1-4). The world has been naturally generated based on a carefully selected seed, started on Minecraft 1.9. Currently it’s 17 x 17 km in size. In the overworld, your inventory stays with you upon death, to minimize unwanted PvP consequences. This doesn’t apply to the Nether and to the End, so mind your step. The Nether and the End are reset regularly, so we don’t recommend building any larger projects or living in these dimensions. Also, /sethome and /tpaccept are disabled in the End, to keep it challenging even for overpowered players. 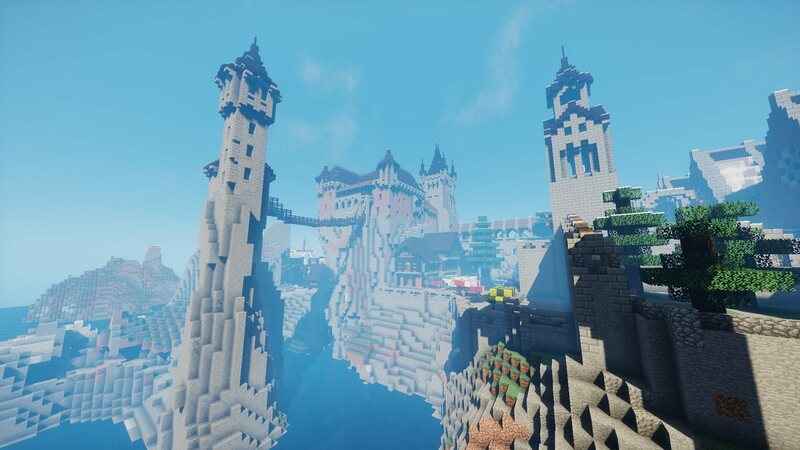 There is also an additional world called wilderness („divočina“) which is uncharted, unlimited, and in settings very similar to the Nether and the End. It’s dangerous but can be rewarding as it offers free exploration of lands untouched by man. You can display more info on the wilderness in-game using /wilderness. PvP is enabled but it’s against our rules to abuse it (refer to rule 2). We don’t provide private protected regions (residences). You are free to explore and make use of the world, as long as you keep a distance from other players so that you don’t interfere with their building and other activities. Griefing is very rare but if you ever get griefed, report it to our admins – they will repair the damage (using CoreProtect) and punish the offenders. Use /spawn to get to our town hall. Use /townhall to find out about its facilities (e.g. a random teleport to the world). To see the live world map, see our Dynmap here. The rules of Dark-Faire have been set to help protect our players‘ interests. Reading them is mandatory for everyone, ignorance of the rules does not excuse anyone (to display them in-game, type /rules). The A-team reserves all rights to edit the rules at any time. 1. Respect other players and basic courtesy in the game. We at Dark-Faire do not discriminate based on age, nationality, or any other irrelevant criteria from the real world. What we care about is how you behave online. We require decency, consideration and good behaviour in any circumstances and we do not tolerate any gratuitous attacks – neither verbal, nor physical. We mean to keep Dark-Faire a friendly place. For your own safety – don’t trust just anyone. Accepting a /tpa request can be risky so if you want to be safe when trading with others, meet at the spawn where PvP is disabled. Also, don’t unlock your containers for people you don’t know. If you want to give someone access, use /cmodify, not /unlock (see commands below). We don’t offer any warranty for the contents of unlocked containers. 2. Do not grief, do not steal, do not harass others with PvP. PvP is fun. It won’t be fun, though, if someone keeps spoiling your enjoyment of the game by killing you constantly. Therefore, PvP is turned on in the world but is forbidden to use without the consent of all players involved. Dark-Faire is not a PvP server! As previously mentioned, we put strong emphasis on the community and building. We want to make sure the effort and time put into people’s creations are not destroyed by griefers. Remember that everything you break or place will be recorded in a database, so always first consider what you do. We define griefing as any unwanted intervention in other people’s creations. 3. Build far from the spawn and from others. Feel free to use the random teleporter at the spawn town hall. Its purpose is to make sure finding a place to live is easy for you. Make sure that your building and mining is unobjectionable – don’t interfere in other people’s homes, don’t build too close to them (unless you know them) and keep a safe distance so you don’t upset anyone, especially if you or they are new to the server. 4. We do not tolerate cheaters and hackers. By playing on Dark-Faire you acknowledge our rules. In an event of you breaking them, you will be sanctioned according to the gravity of your actions. Our aim is to keep the game friendly and fair for you and all others, so don’t take your punishment as a slight but as a warning. If you keep repeating the same mistakes, you may even be banned from our server. Banning is also an effective way of dealing with cheaters and hackers. Fly-hack, x-ray, kill-aura and any other cheats and exploits are bannable offences. If you find anyone that does use such tools, please report them to us. 5. Keep your use of redstone and mob spawners moderate. If you find a mob spawner, you may use it for a mob grinder (XP-farm). However, if you wait long enough and let hundreds of mobs spawn, you may cause server lags. Therefore don’t let any mobs overpopulate, either using a spawner, or by breeding animals. If you cause any lags, your XP-farm will be removed without recompense. If you cause a server crash, you may even get banned completely. Our server uses a 45-minute AFK kick policy and bypassing it is also forbidden. We use a fairly well-equipped hardware at our host’s site, but to make sure the server uptime is not threatened, avoid building overly complex redstone contraptions. The situations are varied, but the general rule is to avoid creating cyclical devices that run indefinitely. Building automatic item sorters or long hopper lines is not recommended due to the amount of transactions the server has to check every second. Building and running systems based on perpetual pouring and collecting water using a dispenser is absolutely forbidden as it causes our grief-restore database to fill up extremely quickly. Restoring griefed property is of high priority, therefore such systems will be identified and dismantled without prior notice.